Every dog may have it’s day but great plant species move in and out of fashion. Now March 2018 it is the turn of Gladioli to retake center stage. 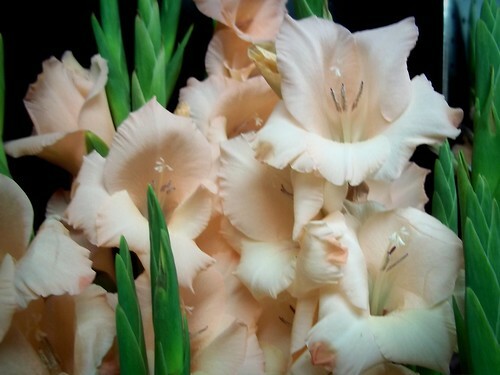 In the 1960’s and 70’s Gladiolus were all the rage and for many gardeners they were top of the popularity stakes. In 2018 they are making a well deserved come back if the media are to be believed. (the media pick up from the trade who must have been undertaking some stock building activities to establish good quantities of corms for sale). I for one have been lead astray by newspaper and magazine articles, vivid coloured packaging of a vibrancy yellow Glad and some carefully targeted adverts. I get these annual urges to focus one plant or group of plants for the year and 2018 is the turn of the gladiolus. After digging out an old bed 7×7 feet square I planned to grow some sweetpeas and Glads so after the orders were placed I watched some ‘how too’s on youtube’ for a refresher course. 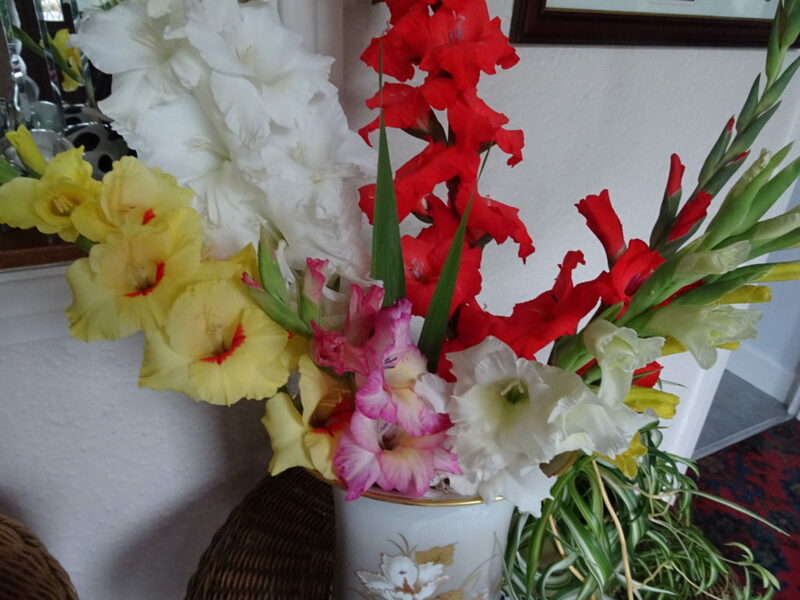 I am not growing for showing so my Gladioli can be grown in a relatively small area hopefully with good results for cut flowers. Objective one has been achieved. 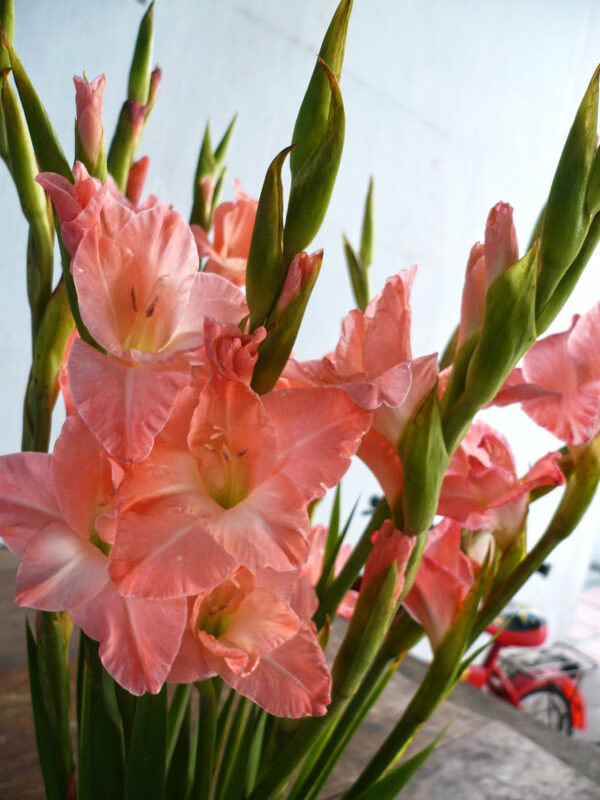 I have the best display of cut gladioli for the house and to give away as flowers to friends and neighbors. Objective two of a good garden display has been less successful in that my staking has led to too many curb=ved blooms and impatience has made me cut the flowers rather than let them blossom in the garden. The colour mix on the other hand has been great and showy. The two stand out colours have been a pure white and strong red. You can get good results by starting the corms off in damp sand to get good roots. The larger the variety more more important it is to stake the plants. (A dwarf variety is disappointingly still to show any real flower this year). Pricilla florets with 6 – 7 per stem on erect spikes with pointed sword-like leaves. 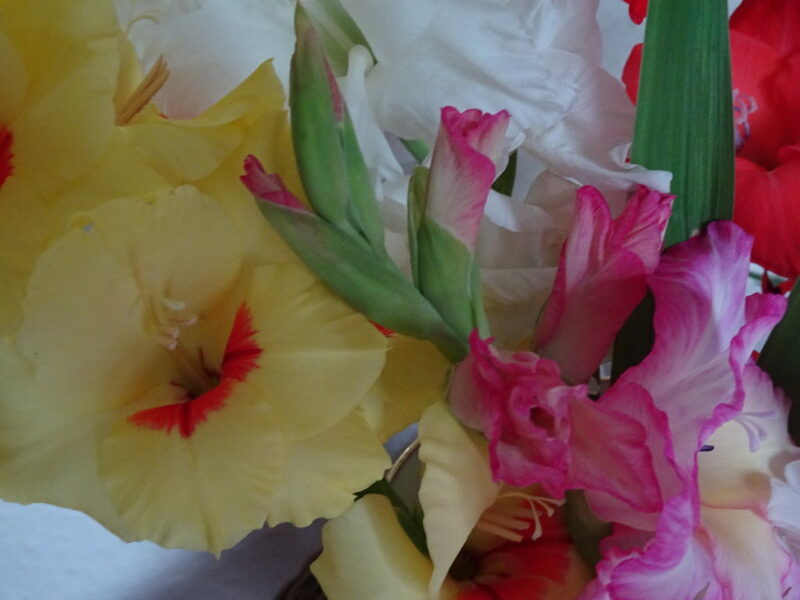 Gladioli are the flower of choice for 40th wedding anniversaries. It is too late for me and the missus now…The official flowers of fifty years of marriage are yellow roses and violets so that will have to do.